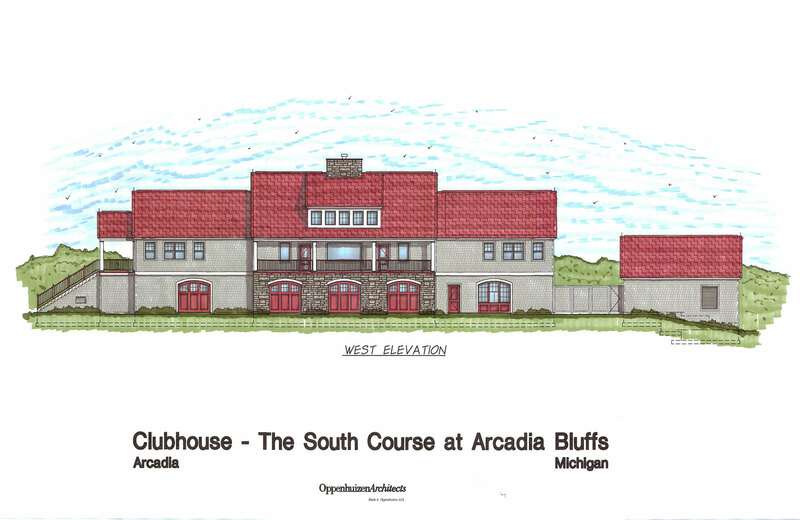 Construction of the new clubhouse at The South Course continues on-schedule with an anticipated opening date of late summer 2019. The recent snow and unseasonably cold conditions have had no effect on the construction progress. The clubhouse will be located directly behind the 18th green allowing for guests to make a quick stop at the turn for refreshments at the snack shop before heading out for the back 9. The three level building will offer panoramic views of almost the entire property from the dining room and covered outside deck. Similarly to The Bluffs Course, a large “tent lawn” area will be located between the 18th green and the clubhouse allowing for guests to relax and enjoy a beverage in the signature Arcadia Adirondack chairs while watching players finish their round on #18. The upper level centrally located dining room and bar will feature a relaxing atmosphere with a wide range of casually inspired menu items including Fried Chicken, Teriyaki Salmon, a Prime Rib Quesadilla, and the northern Michigan inspired Beef Pasty. The Clubhouse will be available for private events and holiday parties all year, the perfect size for an intimate gathering to celebrate that special occasion. Check back for more updates as progress continues and we march toward spring! With three thousand feet of Lake Michigan frontage, our 245-acre course features native grasses, 40 sod-walled bunkers, wide fairways and large greens. Experience this memorable and beautiful challenge for yourself.